Finally comes the time when your analysis converges, and you have the outcomes. As great as it feels, especially if there were convergence issues, now you have to deal with results! However, this is not the end of fun! In the end, you need to see if your analysis results make any sense at all! Verification of FEA outcomes is a tricky thing – one I get asked about a lot! Let’s take a look together at what you can do to verify them. Sadly, there are so many different analysis, that it’s impossible to make a “closed” list. 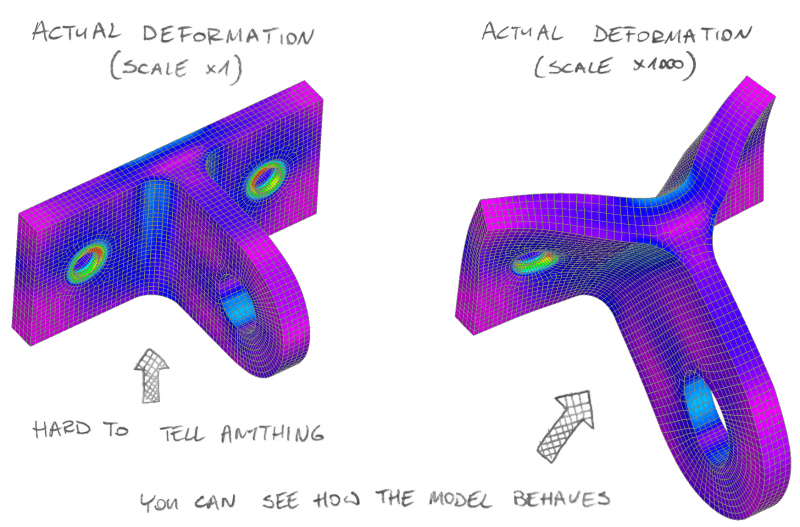 But I do hope that this one will help you to verify FEA outcomes at least a bit! This is a multi-part thing. All of those things are equally important and I’ve seen people ignoring either of them (or all!). Does the deformed model look “nice”? You’ve seen a lot of deformed models already! Also, since you’re on this planet for some time you’ve seen a lot of things deform in real life. This means that you should have a general feeling of how deformations of your model will look like. The question is: do they look like you imagined? Note that sometimes you will have to INSANELY increase the scale of deformations to check that… but it’s still a good idea! 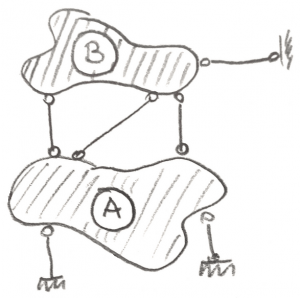 Are deformations reasonable? You know, a 1m beam should not deflect… 10 meters. It’s a bit hard to do for the beam this short! If something goes wrong, such problems may happen. Maybe a nonlinear geometry should be used or your analysis didn’t converge. Whatever the reason check the maximal deformations in your model. In some industries, maximal deformations are simply given in codes. But, even if this is not the case for you, set some “limit values” in your head and stick with them! Is the deformation in the direction I want? If your compressed model elongates… well, you are in trouble! You may think that the only way that this can go wrong is when you apply loads the other way around. And while this would be the most probable cause, I had an arc-length method “turning around” in stability analysis on me. So initially model was compressed but near the buckling load analysis “got dumb” and started to tension the model instead. At first it means less and less compression, but in the end, the model was in full tension! Stress levels on von Mises scale might be more or less ok… but it doesn’t mean everything works as planned! I think this is the thing that people overlook the most. I know for sure I wasn’t paying attention to this in first few years! However, when you make a model you make a lot of assumptions. Many of them are in boundary conditions. It makes sense to check if what you initially assume is actually still true! Do your simplifications still hold? Often you will ignore contact and just support something in both tension and compression (while contact carries only the compression). Do you get only compression in those supports? Check “soft springs” (aka “air hooks”). You may have added some weak, very elastic, supports to your system to stabilize it. A good example would be those 5kN/m springs you attache to an ISO container hanging on ropes so it doesn’t sway. The usage of such elements is clear. Just check if you didn’t get high reaction forces there. If you did… something went wrong! Do things fly “through” one another? Maybe you have ignored contact hoping that the deformations won’t be high. Or maybe something went wrong in contact definition. Whatever the case may be, checking if elements of your model don’t fly through other parts and supports makes sense! Are there any contact stresses in contact zones? Clearly, you defined contact for a reason. If there are no stresses there… something might have gone bad! It would be great to investigate this! Don’t stress… just check it! Stress is most likely the no. 1 thing you want to be sure about. This is reasonable I think, especially if you don’t suspect any stability issues. I wouldn’t advise you checking only this part, as there are other important factors in play. But of course, this must be checked as well! Does symmetric model produce symmetric results? This is a “fun” one. You see… it doesn’t have to, especially if stability is involved (think about a buckling of a normal frame). However, if we are talking about stress, if your model is symmetric, both sides should show the same outcomes. You can’t really check that if you modeled the symmetry in, but if the symmetry line goes through “an important region” I tend not to use symmetry – so I can check that. Is stress distribution reasonable? Similarly to deformations, you should more or less know where the stress will be. Even if you don’t know the values, the “flow” of the stress should be understandable. This should be checked! Also, be cautious with that. I’ve come so many times with good explanations for stupid stress distributions! Several times I even managed to convince myself with them! This is why I train everybody who works with me to initially not trust me! Just be careful with that yourself! Also, making a sketch of what you expect before you see the outcome makes sense. It’s harder to convince the sketch! This is why when I check FEA I try to firstly look at geometry only and make up my mind what will happen… and after that I actually check things. I found it harder to fool myself when I do this! Is stress continuous? As you can see above, averaging in the display can make everything look so nice! But is it in reality? Just turn it off in your software and take a look at the “raw” outcomes. If the “jumps” in stress value from element to element are too high… you have a too big mesh size! I hope you found this useful! If you did please give me a favor and share this posts with your friends and colleagues that might be interested! Checking reactions is worthwhile. If the reactions don’t equal the applied forces then you haven’t applied the forces you thought you had! This is a really great point – thanks for adding that! Łukasz Skotny, thank you ever so for you post.Much thanks again. Thanks for the easily digestible troubleshooting tips Łukasz! Glad that you managed to sort this out!